Alyson Richman explores how artists continue to create, even when confronted with horrific circumstances. 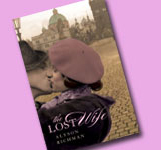 Book synopsis: Alyson Richman’s novel, The Lost Wife, begins with the reunion of a couple who have not seen each other for 60 years, each thinking the other had died in the Holocaust. Richman imagines the 60 years of separation between these two, creating an epic love story that begins in glamorous pre-war Prague, but takes a tragic turn as Czechoslovakia is swept into the fold of the Nazi Occupation. In a story wrought with emotional intensity and woven with historical detail, The Lost Wife also reveals the true story of a secret resistance of artists during World War II in the ghetto of Terezin. Would you let our readers know the wonderful source of inspiration (namely, the discussion at a hair salon) that inspired this novel? When I heard that story, I knew I had the perfect framework for my novel. I would begin and end it at the wedding scene, but would invent this couple’s journey in between—how they fell in love but became separated during the war, and how they each begin new lives afterwards. I made Lenka, the “lost wife” of the story, a young art student at the onset of the war so I could weave in my historical research on artists who survived Terezin and Auschwitz using their skills. This way, my readers could learn about these artists, who took great personal risks to document their experiences, while also being swept away in this couple’s love story. Lenka, one of your main characters, wants to become part of a secret resistance of artists trying to get their art to the outside world. Was this based on a real group of Jewish artists and, if so, can you explain? Yes, it was. Terezin was a Nazi-established ghetto located outside of Prague. Although far better than Auschwitz, the conditions within Terezin were horrific. Starvation, severe crowding, and disease were all wide spread. Yet, somehow, there was a tremendous amount of cultural activity within the ghetto. There were musicians who managed to perform, operas staged, and even a clandestine newspaper. It was amazing to discover how much creative energy flowed in such challenging circumstances and how many risks were taken so that people could sate their need for self-expression. My book, however, goes into detail about a select group of artists who worked in the Technical Office of Terezin, which was responsible for doing blueprint drawings for the expansion of Terezin, as well as propaganda art for the German captors. There was another studio, called the Lautscher Department, where Jewish artists were forced to make postcards or copies of Old Master paintings that were then sent back to the Reich to be sold to the German population. A Jewish Czech artist and cartoonist by the name of Bedrich Fritta oversaw the artists in this department; later, he was assisted by a German Jewish artist, Leo Haas. Both men, along with Pietr Kien and Otto Unger, and a few other artists, stole supplies so they could accurately document the starvation, diseases, and other suffering within the camp. While they hid most of their work within the ghetto, they also were able to get some of it to the outside world with the help of a fellow inmate named Frantisek Strass. This infuriated the Germans and led to severe repercussions (torture and subsequent transport to Auschwitz) for these artists. Tell us about meeting with some survivors from Terezin in the Czech Republic. What was that experience like for you and how did that come to happen? I was lucky enough to be introduced to two survivors of Terezin, one who is now the chairperson of the Terezin Initiative, a network of survivors that keeps them connected throughout the world and also facilitates education about Terezin. She was able to introduce me to one of the artists who actually worked in the Technical Department making drawings for the Germans. This artist was especially helpful because her husband was one of the first Jewish engineers the Nazis conscripted to enlarge the ghetto and its infrastructure. In exchange for their work, they were promised they would never be transported “east” (i.e., to Auschwitz). Of course, the Nazis lied, and he was sent to Auschwitz (but luckily he survived). But, before that, he was one of the engineers that helped hide Fritta’s and Haas’s works. Because these engineers knew every nook and cranny of the ghetto, they were able to hide the artwork in places no one would ever think to look. Your book is praised for describing “many types of love.” Can you explain which types you address, and is there one particular type of love you liked writing about more than the others? Why? First and foremost, there is the overarching love story of Lenka and Josef, the two main characters of the book, who meet and fall in love as young students. There is also the love between parent and child, the love between sisters, and then, later on, the bond of friendship Lenka experiences in Terezin. But, perhaps more interesting, is the love that both Josef and Lenka each experience within their second marriages. It is the complexities within those second loves that I enjoyed exploring the most. On the surface, Josef’s second marriage seems loveless. Lifeless. But it evolved from a shared past of lost family and survivor’s guilt. Lenka’s second marriage, however, is probably the biggest surprise to the reader, because it is a very different love than she experienced as a young girl. I think at the end of the novel, you feel as though you’ve taken this very long journey with Lenka, and you see how her gratitude to her second husband (for saving her and building a family with her) has transformed her. That love has a beauty uniquely its own. Some of your characters are based on actual historical figures. Could you tell us about one or two, including Friedl Dicker Brandeis? How did you know about her? Friedl Dicker Brandeis was an artist and teacher who was instrumental in the creative life of Terezin. There is a beautiful book entitled I Never Saw Another Butterfly, which is a collection of the poetry and artwork these children created under Friedl’s encouragement and guidance. An artist herself, Friedl was the first to introduce art therapy to the children of Terezin, rallying fellow inmates to steal supplies for her so the children could express their fears, frustrations, and innermost feelings through drawing and collage. Another artist, Dina Gottliebova, also appears in the novel. She was a Czech artist who was first sent to Terezin, where she initially worked in the Lautscher Department doing postcards for the Reich. Later she was transported to Auschwitz, where she made a mural of Snow White and the Seven Dwarves on the wall of the children’s barracks in an attempt to offer some comfort to those children. Mengele heard about her mural and, in exchange for not sending her and her mother to the gas chambers, she survived Auschwitz by doing finely detailed drawings and watercolors of Gypsies for him. Much of the book explores the idea of memory and its value. When is memory a jail and when is it a safety net? I was very curious to explore the power of memory in this novel, [something I also did in a prior novel, Swedish Tango, about a woman who survived torture and abduction by the Pinochet regime in Chile in the 1970s]. How memory can sustain us and how it can also haunt us. Josef clings to Lenka’s memory in order to survive emotionally, but Lenka tries to suppress her memory of him in order to forge a new life. But it’s Amalia’s character (who met Josef after the war, and was the only member of her family to survive) that I think is the most heart-wrenching; she remains trapped in her memory, haunted by her family’s death, and remains very much a ghost to both Josef and the reader, even more so than Lenka, ironically, whom Josef mistakenly thinks has died in Auschwitz. For Amalia, her memories are very much a jail. What do you hope readers will take away from this novel? Most important for me is that my readers learn about Terezin and the cultural life that existed there despite the risks and conditions. On a more spiritual level, I hope they will think about the resilience of the human spirit, not only to create, but also to love and to remember. Is there a question you wish I asked? What is it, and what is your answer? Perhaps, how has writing this novel changed me? And my answer is that it has taught me to have enormous gratitude for what I have in life. In researching this novel, it was impossible not to think of what I might have done in Lenka’s situation, or any of the characters I depict. As the mother of young children, I couldn’t help but envision myself as a parent facing the Holocaust, the sheer terror in not being able to protect them. But aside from being a parent, I’m also a daughter, an artist, and a wife. Each of those identities has its own complexities and responsibilities. More than ever, I’m grateful for the peace in my life. The sound of laughing children, my parents living close by, and a few hours everyday to paint, to dance with my children and, of course, to write.